Amara Tabor-Smith describes her experimental dance theater work as Afro Futurist Conjure Art. Her dance making practice, utilizes Yoruba spiritual ritual to address issues of social and environmental justice, community, identity and belonging. A San Francisco native and Oakland resident, she is the artistic director of Deep Waters Dance Theater (DWDT) and was the co-artistic director of Headmistress, an ongoing performing collaboration with movement artist Sherwood Chen. Her work has been performed in Brazil, The Republic of the Congo, Judson Church/Movement Research, NYC and many venues throughout the San Francisco/Bay Area and United States. Amara has performed in the works of dance and theater artists such as Ed Mock, Joanna Haigood, Pearl Ubungen, Julie Tolentino, Ronald K. Brown, Faustin Linyekula, Ana Deveare Smith, Marc Bamuthi Joseph, and she is the former associate artistic director and dancer with Urban Bush Women. 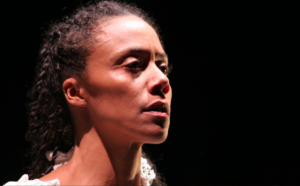 Residencies and awards include The Headlands Center for the Arts artist in residence, CHIME Mentorship Exchange grant, CounterPULSE artist in residence,Sacatar Residency Fellowship in Itaparica, Bahia, Brazil; Green Choreographers exchange at Dance Exchange in Maryland, and she was an artist in residency at ODC Theater from 2013-2015. She is a 2018 USA Artist Fellow, is a 2017 recipient of the Urban Bush Women Choreographic Center fellowship, and is a 2016 recipient of the Creative Capital Grant with Ellen Sebastian Chang. Other grants and awards include The Zellerbach Family Foundation, The Creative Work Fund, The Kenneth Rainin Foundation, The Wallace Alexander Gerbode Foundation, Theatre Bay Area/CA$H, and The East Bay Community Foundation, MAP Fund, Richard Monroe Foundation, Sam Mazza Foundation and the Akonadi Foundation. Amara received her MFA in dance through Hollins University and The Frankfurt University of Music and Performing Arts in Germany, is a continuing appointed lecturer of dance in the Department of Theater, Dance, and Performance Studies at UC Berkeley and is an artist in residence at Stanford University. Headmistress has performed as part of curated group shows including Judson Church/Movement Research’s venerable weekly series in New York; CounterPULSE in San Francisco,Topographies: Sites, bodies, technologies, an international conference hosted by Society for dance historians and Scholars, and the Dance Critic’s Association at ODC Commons in San Francisco, and Left Coast Leaning at Yerba Buena Center for the Arts in San Francisco. Headmistress has been described in the San Francisco Chronicle as “spatially and stylistically disparate by design….to finally move in satisfying consonance against a fluidly organic framework”. Tabor-Smith and Chen were 2010 Artists in Residence at The Headlands Center for the Arts and continued their collaborative explorations through self created residencies at L’ecole des Sables in Toubab Dialaw, Senegal and Espaço Xisto in Salvador, Bahia, Brasil. Most recently, Headmistress was awarded residencies at Le Point Éphémere in Paris and ODC Theater in San Francisco.